﻿ A Story a Week : Thanks Elvis! Regular readers of A Story A Week know that I have recently been including stories based on episodes from the year I spent in England after leaving university in the early 1970s. We will have some more of those stories next month, but today, let's have one, not about visiting England, but about leaving it. The reason? 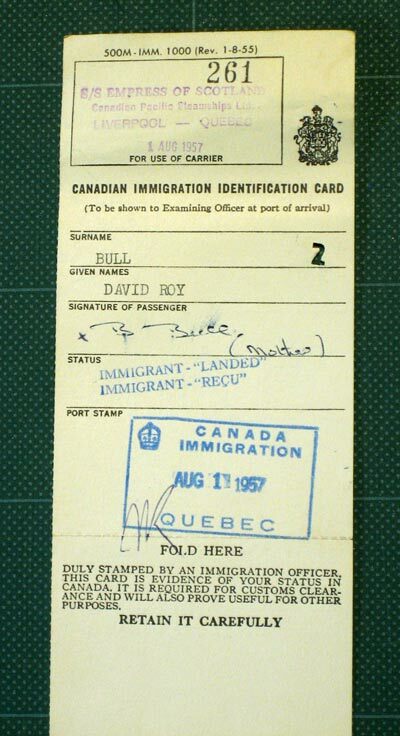 This month marks the 50th anniversary of our family emigrating from England to Canada. I have here a small slip of paper, stamped on the 1st of August 1957, identifying me as a passenger on the ocean liner Empress of Scotland, and allowing me entry to Canada with the status 'Landed Immigrant'. Why were we there? Why would my parents have given up their life in England to start from scratch in a new country, where they knew nobody? The simple answer is ... because of Elvis Presley! In the late 40s my father had worked as a saxophone player with various dance bands around England, gradually developing his skills and making a name for himself. He seems to have become pretty good at the job, because in 1950, he got a call from one of England's biggest bands of the day, the Oscar Rabin Orchestra, inviting him to be their baritone sax player. This was the 'big time'; getting this job meant that he could ask my mother to marry him, and their partnership became official! His early years with the orchestra involved a lot of travelling, playing in dance halls in every corner of the country, but through most of the middle 50s, they were based in London, with a residence at one of the city's largest dance venues, playing to thousands of people each week. But then came the arrival of rock and roll, and the audiences for swing bands and the older type of dance music started to slip away. Three or four young men on stage with a couple of guitars could get the crowds up and dancing just as easily as an 18 piece orchestra, and a lot more cheaply! And of course, the new rock music was much more exciting for the young audiences. The handwriting was on the wall for the old-style orchestras, and one-by-one they gave up playing. It was clear to my father that there was no future as a dance band musician! So he and my mother cast around for an alternative. It would perhaps have been possible to make a living in London as a freelance musician, but with so many out-of-work orchestra musicians chasing so few jobs, it would have been a very difficult existence, especially as he now had two little children to support. They learned about a job offer overseas - the Canadian government was encouraging immigration from all over Europe, and in particular, the Canadian Air Force was recruiting musicians for some of their military bands. They decided to take the plunge, leaving behind everything they knew, all friends and family, and striking out to a small city on the Canadian prairies, where they would build a new life. The Air Force flew my father over first, to let him get started with the job and find a place to live, and my mother followed more slowly. What is now about a nine-hour flight, took her nearly two weeks by ocean liner and transcontinental train, travelling with two young boys, five and two years old. She has many stories to tell about the trip, and perhaps we'll 'interview' her for a future Story A Week about it!